I dropped off the other hikers in town. It’s my anniversary today. I start driving toward the cozy studio apartment I’ve rented with a view of Mount Leconte. The plan is for Mike to join me for the weekend and then I will finish this section of hiking. Trees and downed utility poles line the road. My most pressing concerns are the likely lack of electricity in the rental and the closed roads surrounding Gaitlinburg which might prevent Mike from getting here. Goodnews has become my official trail name and I am beaming with good news when I arrived at the studio apartment to find the lights working. I love electricity! I call Mike and explain the situation. He says a storm is not going to keep him from seeing his baby. True to his word, he makes it to Gaitlinburg in spite of multiple road closings and detours. I savor our time together. 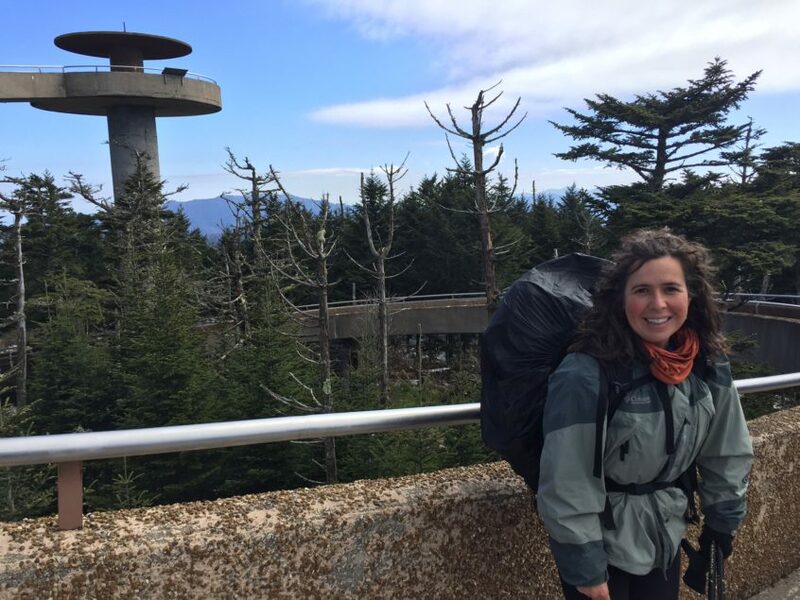 I want to stay wrapped up in blankets looking at Mount Leconte forever. Sunday arrives too soon and I feel depressed about returning to the trail. Why do good things eventually have to end? Trying to help, Mike reminds me that I don’t have to do this and that I can come home if I want to. He takes me to lunch and I delay leaving as long as I can. I want to go home but instead I go back to Newfound Gap and start hiking towards Collins Shelter. The ground is like a big slushy with melting snow and mud everywhere. My pack gets wet because I don’t think to cover it and my socks are soaked from my boots wading through too many ice puddles. When I arrive at the shelter, nobody is there so I strip out of my wet clothing and put on some thermals. I huddle up in my sleeping bag with a book on Buddhism and try to get warm. I drift in and out of sleep. Passages from the book talk to me and my present situation. And why is it you suffer? The lesson that I am being called to learn is appropriate for the Smokey Mountains. I will hear the question, and why is it you suffer, repeated many time during this trying and beautiful section of the Appalachian Trail. Klingman’s Dome has visibility when I arrive mid-morning. This is a treat. Many hikers arrive full of expectations of a panoramic view only to find clouds. That’s the thing about scenic places, you’re not guaranteed a scene if the weather doesn’t cooperate. But when it does, it’s breath taking. My mood changes as the weather improves. The concept of impermanence is being showcased to me. There is so much for my soul to learn if I surrender to the trail. And if I continue to fight it, there’s sure to be more suffering. My last night in the Smokies, I arrive at a rustic campsite after an 18 mile day. I’m tired but it’s a good tired. I indulge in an entire pot full of macaroni and cheese and tuna. With all the squeeze cheese and added oil I used, it is about a 1,500 calorie meal. I’ve been eating whatever I want when hiking and still have lost 5 pounds. That’s the perk of hiking up mountains and down mountains all day. For all my earlier wanting to go home, I take my sweet time on the last day. I have coffee at the firetower and chat with a hiker from Maine. I watch wild turkeys scratching for food on the side of the trail. I look for the mama bear and her cubs that other hikers saw the day before near Fontana Dam. Summer is around the corner and I’ve chosen to take some time off before attempting to make it to Springer, GA. I think about my son’s upcoming graduation, our family trip to Las Vegas and the Grand Canyon when our youngest turns 21, a week visiting my folks in Cincinnati and my aunt at Lake Michigan. I am getting to travel and do things that I had put on hold for too long. Fall will arrive before I know it and when it does, I’ll be ready to hike on.